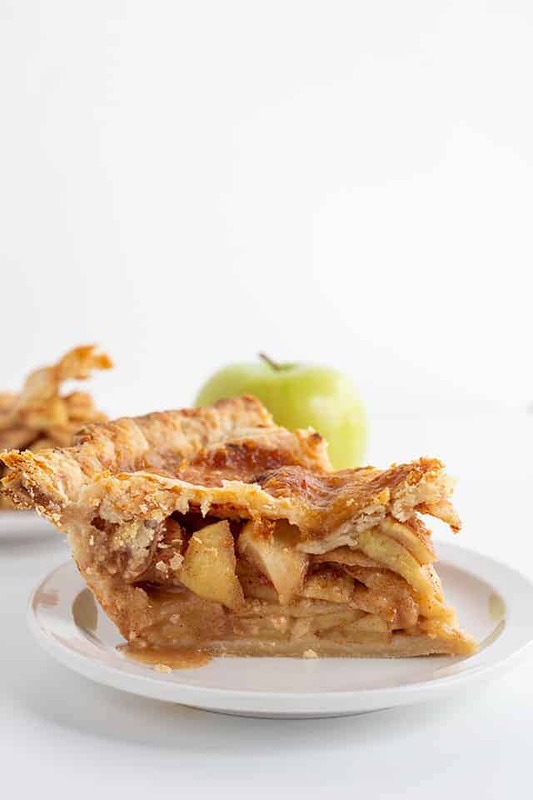 This apple pie with cheddar cheese crust is the perfect pie for the upcoming holidays! The filling is buttery, sweet, and packed full of spices! 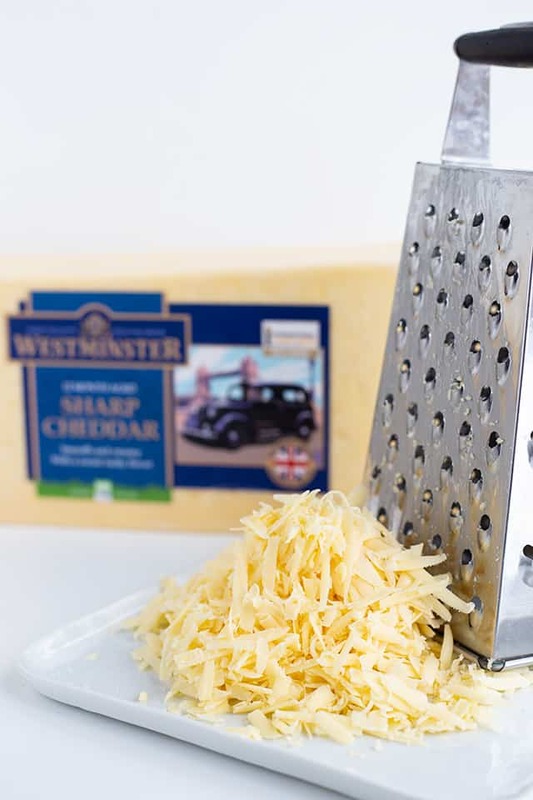 The cheddar cheese crust is made with a white sharp cheddar cheese. It adds another layer of flavor to the apple pie. 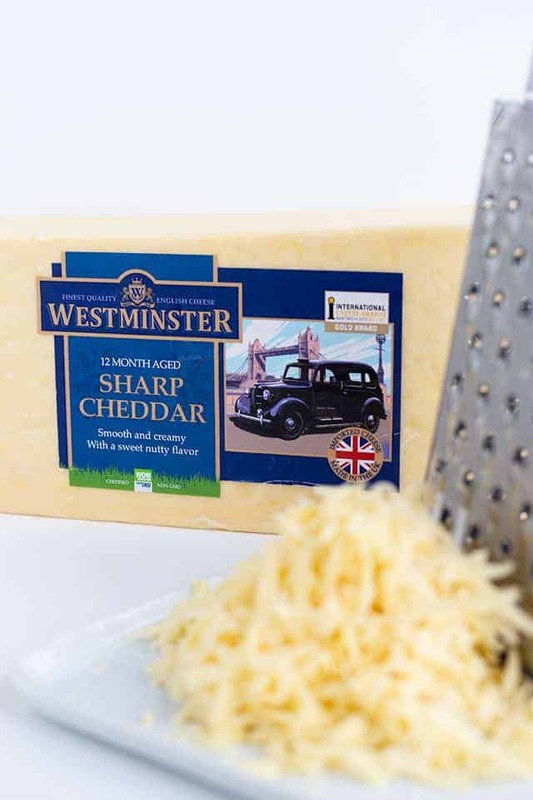 This post is sponsored by Westminster English Cheddar Cheese. All thoughts and opinions are my own. I can’t remember the last time I posted a pie recipe, so it’s about time that I share one! 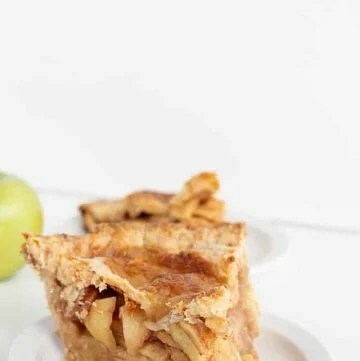 As I was browsing Pinterest, I came across several recipes for an apple pie with cheddar cheese crust. I was intrigued. I had to try it myself. Why was I so intrigued? Because I immediately thought it was another way to have a sweet and salty dessert. It didn’t fail me either. I shredded one cup of Westminster Non-GMO English Cheddar Cheese and added it to my pie crust recipe. If you’re eating a piece of the pie crust without the apple pie filling, you’ll definitely taste the sharp cheddar cheese. I have to say that it did make my pie crust a little less appealing than I would have liked. The crust was bumpy and split apart easier than regular pie crust. That’s okay, just dab a little water on the split and work it back together. 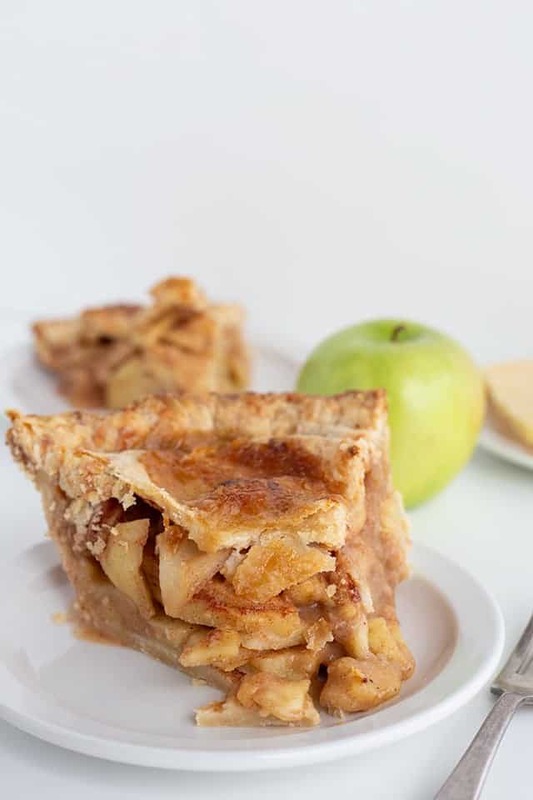 Apple pie was always my favorite pie for the holidays, that is until I came across pecan pie. My mom didn’t make pecan pie though so that was much later in life that I discovered that love. She did make me an apple pie every holiday though. 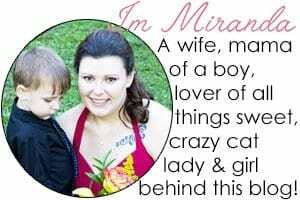 I loved to watch her whip a homemade pie recipe up. The whole table would be covered with flour, bits of pie crust, and a huge bowl of sliced apples that I would sneak a few slices of apple out of. She stopped making me an apple pie because I was the only one that would eat it and too much would go to waste. I did some research on making the perfect apple pie filling and gave it my best shot. It turned out delicious! I had to make some tweaks to my spices. I got a little heavy handed with my ground cloves. For the apples, I went with the good ol’ Granny Smith apples. They’re quite tart but can really hold up to baking baked for an hour or more. There’s nothing worse than when the apples become mushy. 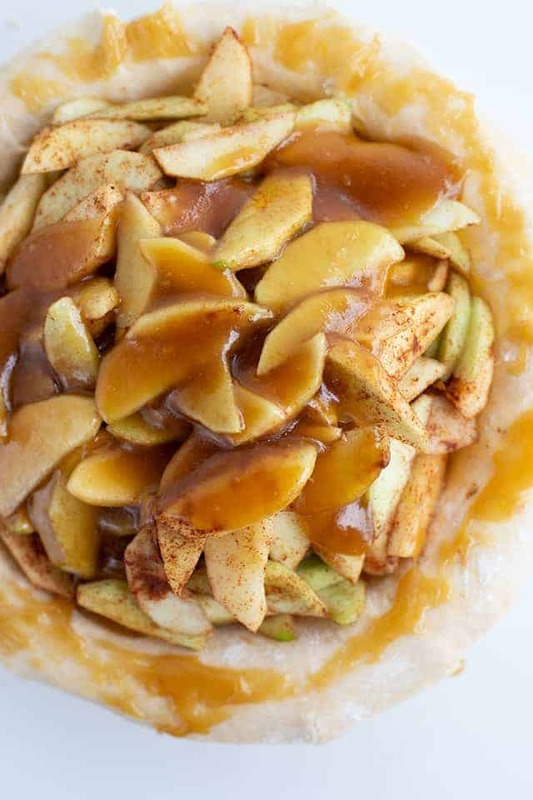 You can also use Honeycrisp apples. I added the spices to the apples and mixed them until the spices were evenly distributed. I piled the apples high in the crust and then started working on the sugar syrup. For the syrup, I made a roux with butter, flour, and cornstarch. Then adding apple cider/juice, the sugars, and salt. Once the syrup thickened, I added in a little vanilla extract and poured almost all of it on the apples. I saved a little to brush on top of the pie crust and to help seal the two crusts. This would have worked perfectly except my sd card needed to be emptied as the sugar syrup was done and that took at least 15 minutes to transfer the files to my computer. In that time, it thickened up. It doesn’t help that I shoot my videos and in the sunroom where it gets really cold this time of the year. I added the syrup back to the heat and thinned it out the best that I could. It worked pretty well except I didn’t have enough syrup to cover the top. You can skip this step and just pour all of the sugar syrup on top of the apples. I would do an egg wash if you’re like me and have 100 things happening at once all the time and can’t immediately brush the syrup on top of the pie crust. I love pie crusts. They’re so flaky and crumbly. This cheddar cheese pie crust is even more crumbly because of the shredded Westminster English Cheddar Cheese that I used. I went with a white sharp cheese. I knew that it would blend in better with the pie crust. After I shredded the sharp cheddar cheese, I got out my food processor. I pulsed some flour, sugar, and salt until it was combined. Then I added in the butter and pulsed that into pea-sized pieces. I added the rest of the flour and pulsed that a couple of times to incorporate it. Then I dumped the flour mixture into a bowl and stirred in the Westminster English Cheddar Cheese. I added some cold water until the flour mixture stuck together when I pinched it. I like to chill the dough for at least 45 minutes to an hour. 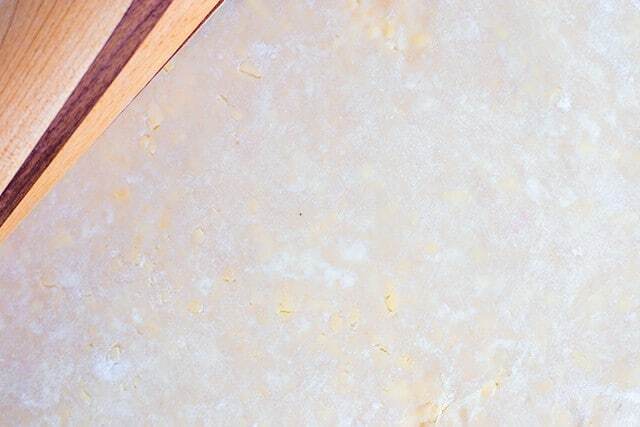 It’s good to give your cheddar cheese pie crust time to settle down and relax so it’s easier to roll. Can you see the shredded cheddar cheese in the dough? 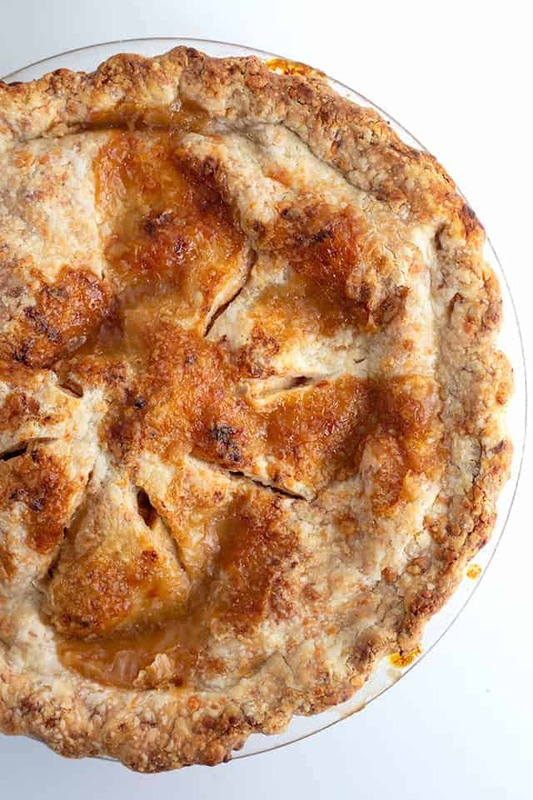 Can you freeze an apple pie with cheddar cheese crust? Yes! Make sure it’s wrapped really well and it should last in the freezer for about a month. I would recommend making it in a foil pie tin too instead of your regular pie tins. To bake it after it’s been frozen, just pop it in the oven while it’s still frozen. 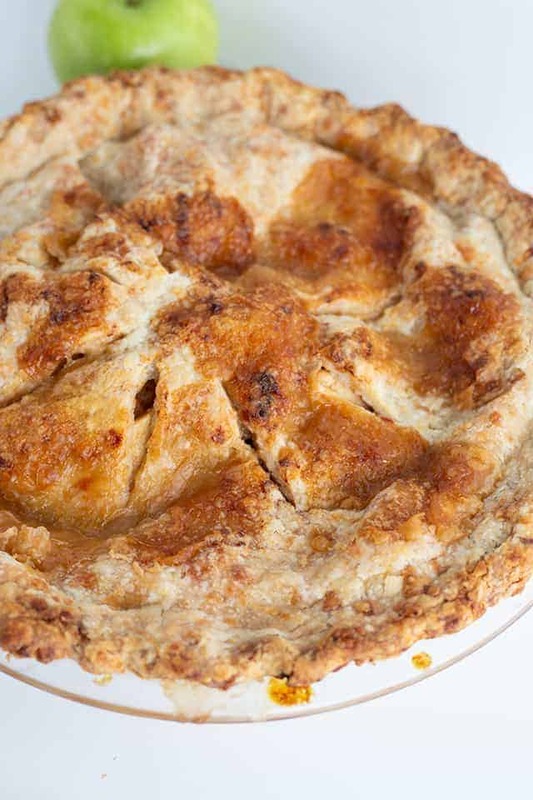 How long will this apple pie recipe last? It should last several days covered in the fridge. In a food processor, add 1 and 1/2 cups of flour, salt, and sugar. Pulse until combined, It should only take a few pulses. Add in all the cubed butter and turn the processor on high. Let it mix until the butter is in pea-sized pieces. This will take about a minute. Add in the rest of the flour and pulse 5 - 10 times to mix the flour well. Dump the flour mixture into a bowl and add the cheddar cheese. Stir to combine. Add in 6 tablespoons of water. Mix with a spoon thoroughly. If you pinch the dough and it stays together, it's ready! If you pinch the dough and it falls apart, add 1 to 2 more tablespoons of water. Turn the crust out onto a clean workspace and knead it until the dough has formed into a ball. When you first put it on the workspace, it will fall apart and be crumbly. It will come together. Split the dough into two pieces and form them into discs. Cover them with plastic wrap and place them in the fridge for about 1 hour. After the hour is up, take one disc out of the fridge and put on a floured surface. Flour the top of the dough and rolling pin also. Roll out into a circle. You'll want it to be about 12 inches. Fold the dough in half and pick it up and place onto the pie plate. Unfold the dough and push the dough onto the bottom and sides. Trim the edges. I cut them even with the edge of the pie plate using a knife. Set aside. 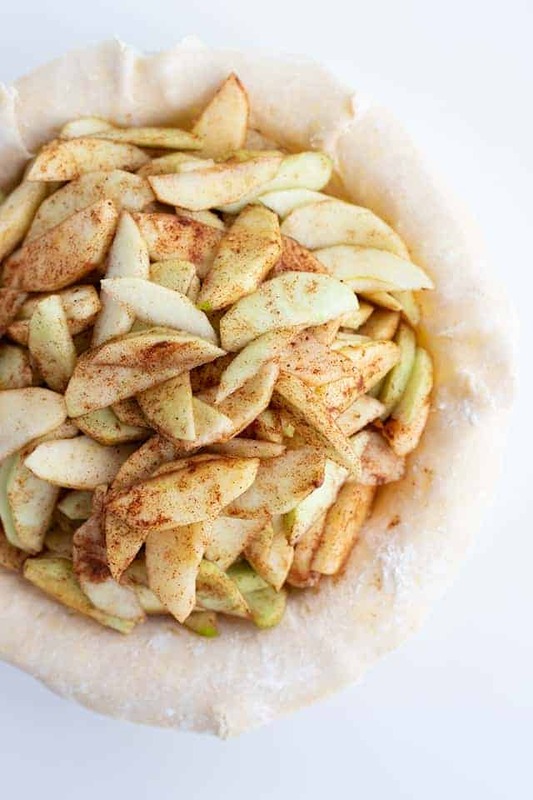 In the large bowl of sliced apples, add in the cinnamon and nutmeg. Stir until the spices are evenly distributed. Pour the apple slices into the pie crust. Set aside. In a medium saucepan, add in the butter. Place over medium heat and let the butter melt completely. Add in the flour and cornstarch. Stir until the flour and cornstarch are both incorporated. Add in the apple cider/juice, granulated sugar, brown sugar, and salt. Stir to combine. Let the mixture come up to a boil and boil for 1 minute. Reduce heat and simmer for another minute. Pour the mixture on top of the apples. You can reserve about 1/3 of the mixture to brush on the top of the pie crust if you want it to resemble mine. I would just pour it on top of the apples. Lay the top layer of dough on. Cut some steam holes into the top layer. You can cut the steam holes before you place the dough on the pie or after. If you're brushing the rest of the sugar syrup on the top of the pie crust, do this now. Place into the at 425 degrees for 15 minutes and then turn the heat down to 350 and bake another 50 minutes. Cool the pie for about 2 hours before slicing.